Ripe Saivite Saint Tirunavukkarasar had sung the glory of Lord of Tiru Valanchuzhi in his Thevaram hymns. 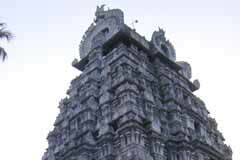 This is the 25th Shiva temple on the southern bank of Cauvery praised in Thevaram hymns. Maha Shivrathri in February-March; Tirukarthikai in November-December and Vinayaka Chaturthi in August-September are the festivals celebrated in the temple. Lord Valanchuzhi Nathar is a swayambumurthi. 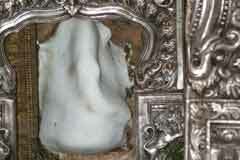 Lord Vinayaka idol is made of the foam of Milk ocean (Tiru Parkadal), hence praised as Swetha Vinayaka – Vellai Vinayaka. Vellai in Tamil means white. The beautiful tower of the temple is facing east. Ambica graces the devotees in Her wedding posture on the right side. Mother Ashta Buja Kali, very furious earlier appears with a minute damage (in the idol) to calm down her anger, it is said. 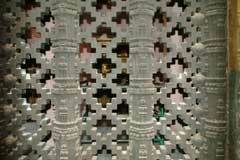 There is a separate shrine for Sani Bhagwan. People pray for removal of obstacles in marriage proposals and to have a fair complexion. Devotees perform abishek to Lord and Mother, offer vastras and contribute to temple funds. Devendra (Indira) came down to earth with Swetha Vinayaka seeking relief from the curse caused by his wrong behaviour towards Agalya. He came to this place finally after worshipping various Shiva temples. Lord Swetha Vinayaka, till then with Indira, wished to stay in this place for ever and prayed to Lord Shiva for the purpose. Lord Shiva came before Indira as a little boy. Indira asked the boy to keep his Vinayaka till he came back after worshipping Lord Shiva. The boy simply put the Vinayaka on the floor and disappeared. Indira could not find either the boy or his Vinayaka. He finally found his Vinayaka under the Bali Peeta in the temple but could not lift despite all his efforts. 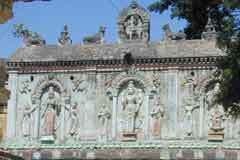 Indira brought Deva Shilpi (sculptor of great skills), made a Rath – car covering the surroundings of the Bali Peeta and tried to pull Vinayaka to his place, but in vain. A voice said that if Indira worships Vinayaka in this place on each Vinayaka Chaturthi day (occurring in August-September), he would reap the benefit of worshipping Him each day. 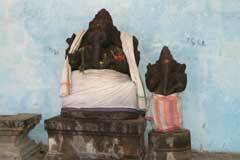 It is believed that Indira visits the temple on each Vinayaka Chaturthi to worship Lord Swetha Vinayak. Lord Swetha Vinayaka is made from sea water foam. Hence, no abishek is offered nor flowers, vastras or sandal placed on Him. 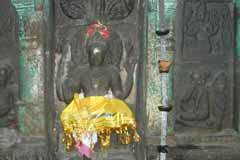 Only powdered Borneol (Pachai Karpuram) is sprayed on the idol without hand touch. As Lord Muruga has 6 army camps – Padai Veedu in Tamil – Lord Vinayaka has 10 such in India including the one in this Thiru Valanchuzhi temple. Lord Vinayaka married here Indiradevi Kamalambal born of the eyes of Lord Maha Vishnu and Buddhi Devi born of the speech of Lord Brahmma in this sacred place, hence, those facing obstacles and problems in their marriage efforts worship Lord Swetha Vinayaka for reliefs. With the graceful blessings of Lord Swetha Vinayaka, Mother Cauvery River began to flow towards Chola region from the Kamandalam of Sage Agasthya. Kamandalam is a pot usually carried by sages. Knowing that Mother Cauvery is flowing towards his kingdom, Chola king Haridwajan went with his men to receive Her with all honours. While entering this place, respectfully called Shakti Vanam, She circumambulated Lord Shiva (Valam Varudhal in Tamil) and entered through a hole (Piladwara in Sanskrit) in the northeast (Eesanya direction). Despite all efforts, the king could not bring out Cauvery. He surrendered at the feet of Sage Heranda performing penance in Kottayur. 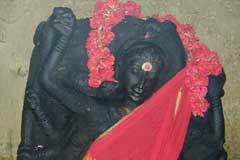 The sage came to Thiruvalanchuzui and prayed to Lord Shiva. Lord Shiva through His voice (Asareeri in Tamil and Sanskrit) said that Cauvery would not come out unless a sage with Jadamudi-thick and long hair- or a king with such Jada entered into the hole. The king was ready to do this. But the sage himself entered the hole and made Mother Cauvery come out to benefit a huge number of people in the state. Mother Cauvery came out from the hole at a place called Melacauvery near Kumbakonam. 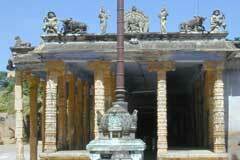 As Cauvery came up, the place is named Melacauvery and Tiruvalnchuzhi as She came circumambulating Lord Shiva. The story of churning the milk ocean to get nectar with Mandara mount as the churning stick (Mathu in Tamil) and Vasuki snake as the churning rope is popular among Hindu believers. Unable to bear the speed and weight during this operation, Vasuki spit its venom threatening total destruction of all worlds. Devas surrendered to Lord Shiva. 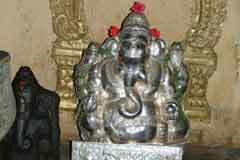 He said that they began the work without worshipping Lord Vinayaka and advised them to correct the error. Devas returned to milk ocean, made an idol of Lord Vinayaka with ocean foam and prayed to him and succeeded, thus goes the Sthala Purana. Vinayaka thus made of the foam is praised as Swetha Vinayaka. He is the Ishta Devatha of the Devas. Miracle Based: Lord Shiva in the temple is a swayambumurthi. Lord Vinayaka is praised as Swetha Vinayaka as he is made of the ocean foam. 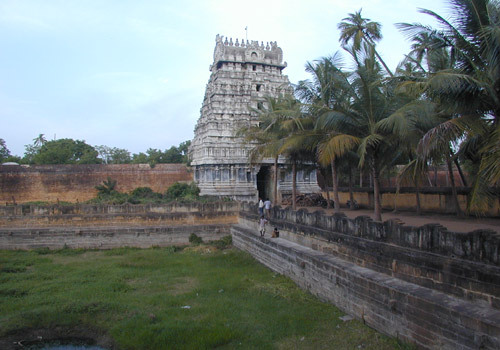 Thiruvalanchuzhi is 4 km from Kumbakonam on the Thanjavur road and 1 km from Swamimalai. Bus facility is available.